Cancer - the Story of a Comeback in Europe? Cancer – the Story of a Comeback in Europe? The increased life expectancy in Europe causes the increase of cancer to rocket sky-high - since 2004, with 3,000 cases the number increased to more than 3.2 million new cancer cases in 2006. In an up-to-date publication, oncologists warn: Beware this time bomb! Does the therapy of malignant melanomas mark time? For Peter Boyle, director of the International Agency for Research on Cancer (IARC), located in Lyon, the published figures are highly alarming. Because the European countries have to get ready for a significantly increasing number of cancer patients – despite better provision- and treatment resources. 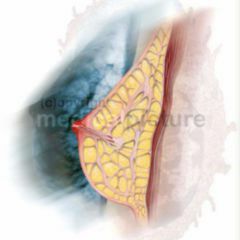 In particular for the countries of Central- and East Europe, Boyle calls for screening programs in order to keep the foray of lung-, intestinal- and breast cancer at bay. Actually, lung cancer will remain killer no. 1. In 2006, 334,800 people died in the EU, which is – with 19.7 percent – top on the list of all deaths caused by cancer. During the same period of time, colon cancer killed 207,400 people, while a total of 131,900 women on 25 EU countries died of breast cancer. 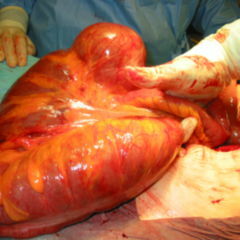 Stomach cancer claimed 118,200 victims. Alongside the number of deaths, the rate of new cancer cases grows. In 2006 for example, European physicians had to treat about 429,000 new patients with breast cancer plus another 412,000 with colon cancer and 386,300 new cases of lung cancer. But as absurd it may sound: The growing "army" of new patients give also proof and evidence of the successful fight against tumors. For example, the consequent use of PSA-tests was part of the statistic increase in prostate cancer, because it includes those men, who would have "slipped" through the precaution raster without the test. More than 349,000 men had the diagnosis "malignant tumor in the prostate", because the patients relied on the antigen-specific test. If this was the only version of interpretation of statistics – little worries we had. But it looks as if the use of such screening tests alone does not bring down the number of victims, underlines Boyle. The success of a faster diagnosis faces the demographic effect – and in the long run winning in the fight for statistic triumph. The example of prostate cancer shows quite impressively, that diagnoses and better therapies have to be adapted to the aging society. Despite the fact, that the EU-wide prevalence of the PSA tests leads to a safe detection of the tumors, the number of victims increased by 16 percent since 1995. This drifting apart does not come as a surprise to Director Boyle – but as a logical consequence resulting from the increased life expectancy of men in the EU. And what's good the gander, is good for the goose – women keep up. The study predicts a considerable increase in breast cancer as well. Epidemiologists at home note a similar development. On one hand, the number of deaths caused by cancer is decreasing in Germany, as underlined by the Robert Koch – Institute in Berlin exactly one year ago in their cancer statistics 2006. BUT: The number of new cases of cancer has increased. 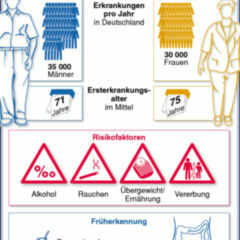 In 2002, the Robert Koch – Institute estimated the number of new cases at about 425,000, i. e. 218,000 men and 206,000 women – more recent figures are not available yet. One thing is for sure though: This estimation for 1980 to 2005 was 30,000 cases higher than the prior one – with a growing tendency. No wonder that the bottom line of Boyle's paper is just as sobering. Even though the population of the 25 EU member states will remain at the same average until 2015, professionals expect a massive growth of cancer cases. Since the group of above 65 is growing by 22 percent, and the group of above 80 by 50 percent, the number of cancer-caused deaths in the entire EU could increase to 1.405 million – from currently 1.249 million. But the end of the road is not in sight: the number of old folks keeps growing.